It was business as usual when pianist Janina Fialkowska walked onto the stage of the George Weston Recital Hall in Toronto a few months ago and played the serene G-major chords that open Beethoven's Piano Concerto No. 4. But business as usual, for Fialkowska, is a very fine thing. The flowing musicality, emotional generosity and spontaneity of her playing have earned the Montreal-born pianist the affection of audiences around the world. And after the finale of the Beethoven romped to its conclusion--Fialkowska having brought out the Slavic soul of the dance--the pianist acknowledged the huge ovation with her usual "aw shucks" humility, as if surprised to find herself the centre of attention. Fialkowska is one of the few female pianists associated with the top-flight virtuoso repertoire of Chopin, Liszt, Szymanowsky, and so on. Despite this she hasn't always had the recognition that she deserves. It was scandalous, for instance, that her poetic 1997 recording of the complete Chopin Études (on Opening Day Records), brimming with subtlety and imagination, wasn't even nominated for a Juno. And the poetry that she brings out in Liszt convinces even those of us who can't bear the composer that there's more than machismo and histrionics in even his flashiest works. As it turns out, the world very nearly lost that rare artistry, not to mention the artist. A little over two years ago, Fialkowska learned that a large, rare, extremely aggressive and malignant tumour had wrapped itself around a muscle in her upper left arm. Normally, doctors would have operated immediately. But in order to maximize the pianist's chances of playing again, she underwent radiation treatments to shrink the tumour. (They did, a bit--while literally burning a hole in her arm.) In May 2002, a surgeon at the Sloan-Kettering Cancer Center in New York sliced into the pianist's arm to remove the 12-cm long tumour. The good news was that the cancer had not spread. And the surgeon, Carol Morris, was able to leave Fialkowska's finger motion intact. The bad news was that Morris had to remove part of the muscle and sever a major nerve in the pianist's left arm. This left her unable to raise the limb, or to move it laterally away from her body. She literally threw her engagement book out. 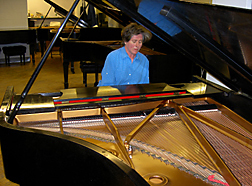 "The doctors were very tough with me about... how aggressive the tumour was," the pianist said in a phone conversation. "But at that time I was much more concerned about playing the piano again than I was about living." However, it was only last November, when it was clear that Fialkowska was going to make a two-handed comeback, that Morris confessed to her patient that she never thought she would play professionally with both hands again. But the pianist, unaware of this prognosis, had doggedly exercised her left hand every day, holding it up to the keyboard for "incredibly boring" and painful half-hour sessions; and there were also the endless physiotherapy sessions. Meanwhile, she learned a few concertos for the left hand, transferring them to her right in order to salvage a dozen concerto dates. "I think my greatest strength throughout the ordeal was that I didn't think too much through it," she said. "I just kept going." In January 2003, another Sloan-Kettering doctor, Edward Athanasian, severed one end of a muscle from Fialkowska's back and reattached it to the damaged arm muscle. This was a rare operation that he had never performed before, she later learned. The transferred muscle, she explained, is called a "spare," because the only people who use it are gymnasts who perform on the rings. "So yeah, my Olympic prospects are over. I'm just devastated," she joked. Less than four months after the reconstructive surgery, Fialkowska lifted her hand to the keyboard, and started playing 18th-century repertoire. "From that point, things moved very fast." By the end of May, she was playing her beloved Chopin again. Athanasian, meanwhile, told her she still had almost another year to develop the transferred muscle. Fialkowska's comeback has made medical history. Still, it's not quite business as usual, as business as usual has changed profoundly for her. "I have to look at everything completely differently. The whole music-making experience is different," she said. "It's forcing me to slow down for a while." 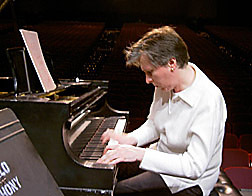 Because of pain--these days, mostly in her upper back and left leg--Fialkowska can't practice for more than two or three hours a day at the keyboard. "So I have to work those three hours very hard, planning everything far in advance," she said. Of course, she pointed out, Chopin always told his pupils never to practice more than three hours a day. Still, it means that she's unlikely to tour with monster programs like the complete Liszt Transcendental Études, which she was about to perform throughout Europe when the cancer struck. But one might say that medically and musically, Fialkowska's entire life has become a transcendental étude, and that she is executing it with her usual brilliance. She has had to relearn the left hand of her old repertoire, creating new muscle memory for the back muscle that is suddenly in charge of her left arm. "Before, when I was in high virtuosity mode, I just let everything run," she said. "I have some of that back already. But the first few hours of work on an old piece are heartbreaking, because I think my left arm is doing nothing. I have to give it orders. But then it becomes automatic again. I think this is a beneficial thing, in truth. I have a very good left hand now, because I'm paying a lot of attention to it. "I'm looking on it as an extraordinary opportunity to re-fall in love with all my old pieces. And when did I ever have the luxury to spend such a long time learning new pieces? Now I feel that I really know my repertoire inside out." Because the lateral motion of Fialkowska's left arm is still restricted, she has had to drop some romantic repertoire, though the casualties are surprisingly few. She performs both Chopin Concerti, for instance, with the McGill Chamber Orchestra later this month, and in July at the Ottawa Chamber Music Festival. But both Brahms Concerti are out for now, as is Prokofiev's 3rd, one of her favourites. Liszt's E-flat Concerto remains a question mark, she says. But when one door closes, another opens. Fialkowska has turned to Schubert for the first time, something many of us have longed to hear her play, as did her late mentor, Arthur Rubinstein. "Schubert is a composer quite unlike all others," she said. "I just felt emotionally unready for him. I felt that I should have as much knowledge as possible of all the other composers before attempting [his solo works]." But shortly before her first operation, Fialkowska, realizing that she might never play again, started learning Schubert's Impromptus Op. 142, in part as a present for her husband, Harry Oesterle, whose favourite composer is Schubert. Eighteen months later, when she resumed playing with two hands, she returned to those pieces, lavishing enormous care over them as she slowly rehabilitated her arm. Now she's ready for the composer. "Schubert is a state of mind. And I have it now. His music is a journey, but a journey that's not necessarily going anywhere, or at least not towards particularly dramatic goals. And I feel that I've been through such a journey myself. I am comfortable with Schubert now." The Impromptus, Op. 142 are on her recital program this year; next up is the big G-major Sonata, D. 894 and his last, sublime Sonata in B-flat Major, D. 960. With her practice time limited, and having stared mortality in the face, Fialkowska has also resolved to play only those things she loves, and pieces she feels she can play well. "When I was younger, I wasn't always so discerning!" she said. "The most important thing for me is that I don't want to play anything that I can't play at my old standard or better. That would be worse than not playing at all." And lest wishful thinking cloud her judgment, Fialkowska now records her practicing constantly. "I'm still euphoric [about performing again], but the novelty has worn off. I'm back to my old self-critical self; I'm certainly not giving myself any breaks any more. I think the public is giving up on it now, too. They've heard the story! And some audiences--for instance, in Wichita, Kansas, where I played recently--don't even know anything has happened to me. I'm just giving a regular concert." It will be interesting to hear, in the coming months and years, what Fialkowska's dark journey has brought to her artistry, which was hardly shallow to begin with. "These two years off have certainly given me perspective on life," she said. "They've given me time to regroup, and catch my breath. I've also improved my German enough not to be a drag on a conversation, and I actually had time to have a little married life!" Fialkowska, who was admitted to the Order of Canada in 2002, has also written a book that interweaves memories of Rubinstein and her life as a concert pianist with her recent experience of cancer. The manuscript is currently in the hands of a literary agent. "So really, I've had what the Germans call Glück im Unglück--luck in misfortune," she said. "I know I'm living some kind of miracle, here... How many people have this extraordinary chance: to lose what they love, then be reborn?" Fialkowska performs Chopin's two Piano Concertos--the orchestral part arranged for string orchestra--with the McGill Chamber Orchestra on May 31 at Pollack Hall, 7:30 p.m. Tickets: (514) 487-5190 or via e-mail: tickets@ocm-mco.org. 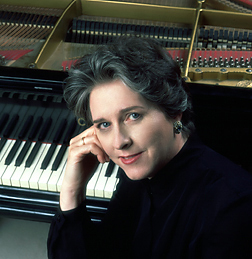 Next season, Janina Fialkowska performs Prokofiev's Piano Concerto No 4 on Sept. 26 at 2:30 p.m. in MSO's "Russian Music Festival" series, and a solo recital with the Pro Musica Society on Jan. 31, 2005.